Around 1610, the Dutch artist Ambrosius Bosschaert the Elder painted an extravagant bouquet of some of the rarest blooms that his countrymen had seen. There were irises, columbines, roses, marigolds and more. But Bosschaert the Elder wasn’t suggesting the latest trend in floral arrangements to his audience. He was aiming for something more. Rendered in exquisite detail, A Still Life Of Flowers In A Wan-Li Vase looked so real, it is said, that one could almost smell the fragrance. In reality, however, an arrangement such as this could not possibly exist—these species couldn’t have bloomed in the same season, and were far too expensive to be cut for the sake of a composition. A still life painter of the Dutch Golden Age, Bosschaert the Elder was toying with the minds of his audience. A newly opened exhibition in Mumbai is exploring the Bosschaert effect in an amplified way. Titled Still/Life, the exhibition is presented by Foam Fotografiemuseum Amsterdam in collaboration with the Jehangir Nicholson Art Foundation (JNAF). On show are photographs and videos by 16 photo-artists curated by Foam’s artistic director Marcel Feil. The exhibition greets visitors with a series of compositions not unlike those painted by the Dutch still life masters. Bouquet (2008), by Maurice Scheltens and Liesbeth Abbenes, is a panoply constructed by collaging paper cut-outs of flowers and fruits sourced from glossies. Scheltens and Abbenes do not mask the artifice of their photo-art entirely. In certain corners, the turn of the paper is exposed, thus calling attention to the fakery of the flowers. Feil, in Mumbai for the opening of the exhibition, says if still life painters were supposed to depict “reality", the pressure on photography to perform the same function is even more so. The camera is expected to capture the truth—a notion that Still/Life busts. “The main idea for the exhibition comes from professional photography practices as noted already some years ago. Quite a few artists, especially from younger generations, decided not to use photography primarily as a medium to document and represent visual reality, but as a medium for free artistic and individual expression. This could be related to the historical painterly genre of still life: a carefully created and considered construction which plays with realism versus illusion, double layers of meaning," he says. As I take a round of the exhibition, it is clear that Feil has managed to include a wide range, but unpacks the underlying theme with ease for visitors. Bouquet, with its clear resonances to the historic practice of still life, gives visitors the tools with which to read Still/Life. The exhibition grows more complex towards the end of the gallery by including video-works. Can a moving image be still life? For the serious epistemic take that the exhibition has at its core, several of the works are humorous in the manner that only the best philosophers can be. Another series by Scheltens and Abbenes, called Baluster (2010), showcases an ornamented vase seemingly made of high-quality steel or silver. It has a strong recall of 17th century still life depictions of luxurious, exotic goods, such as porcelain vases, that Dutch tradesman and colonizers brought home. Baluster is tongue-in-cheek however. It uses tin and plastic jars that reflect cheap linen in order to create the illusion of a luxury artefact. Over the years, Foam has dedicatedly showcased cutting-edge portfolios of Dutch photographers. “Playing with perception is not so much a Dutch element, but the open-minded way of doing so, using irony and dry humour, and the exact way of executing something serious quite light-hearted is typical," says Feil. None elicited a chortle as well as the Potato (2003) series by Anuschka Blommers and Niels Schumm did. They, like the other artists in the exhibition, are also commercial photographers, working with high-end luxury clients and editorials. Under their lens, the humble spud is a stud. In Potato, the lighting befits a Valentino handbag, and the potato is treated with such respect that the irony is unmissable. 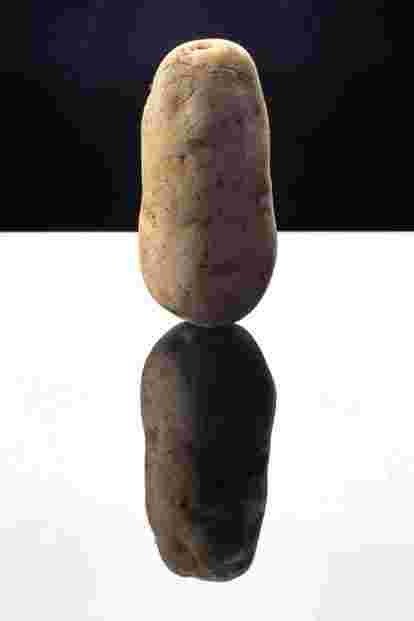 Feil comments, “Normally the potato is not considered worth so much attention, let alone make it the main subject of a work of art made with high technical skills. By doing so, the artists force us to look at reality with different fresh eyes: beauty can be found everywhere. At the same time, it is a way to ironically comment upon the regular parameters of aesthetics and to challenge not only our idea of beauty, but also the industry they work for: high fashion, expensive luxury products and so on. It is both a critic on the medium and a critic on the industry using photography." Still/Life is on till 10 February at Chhatrapati Shivaji Maharaj Vastu Sangrahalaya, Mumbai.